Markets bounced back from predictable support levels, as we mentioned last week. With a couple more lunar green period days to go, we are likely to see some additional upside early in the week, but the question remains if we will get any further than that. 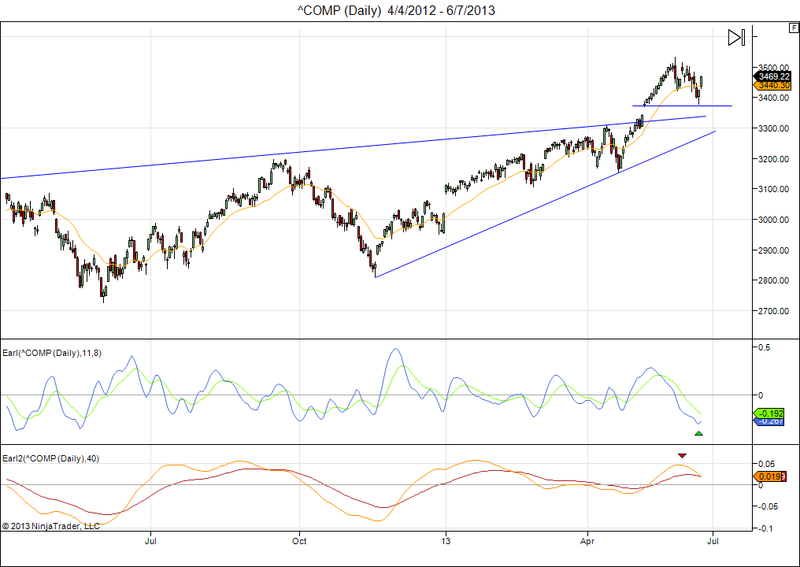 The Nasdaq bounced back from major support just below 3400 and may now go on to create a double top with the May highs. My Earl2 indicator is continuing to show a weakening picture however, with the orange line about to cross below the red line. But the shorter term Earl (blue line) is turning up from a very oversold bottom, which indicates that we are ready for some rebound rally first. It is fairly common to get one more rally (and possibly new highs) after the Earl2 gives a sell signal. This being the case, I would use any rally we get this week to take some profits or buy some protective puts, especially if the market stalls near the 3500 level. The next weeks we could easily see a retest of last week’s lows, as we will be in the next lunar red period. That’s when I would start looking for new buying opportunities, as it is still quite likely that the Nasdaq will get to 3700 this summer, before we get a bigger correction. 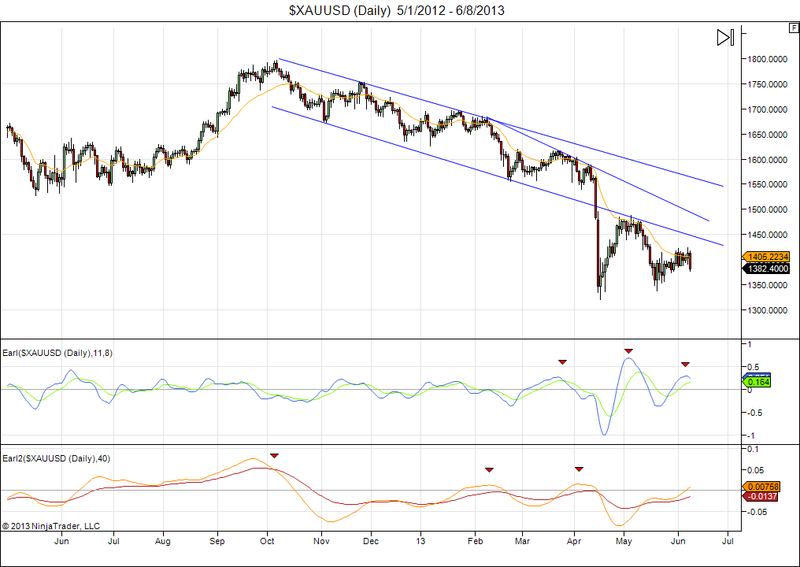 Since the gold crash in April it has tried to rebound, but in the recent weeks the price action has been quite weak. Notice how my Earl indicators have done a good job at marking the major tops in the last year, and how the Earl is now once again turning down. This means the risk for another leg down in gold prices is now increasing. I would stay out until a healthier technical picture appears, or until gold breaks out above the $1422 key level. This entry was posted on June 10, 2013 at 1:28 pm	and is filed under Financial Astrology, Market Commentary. Tagged: gold, Nasdaq. You can follow any responses to this entry through the RSS 2.0 feed. You can leave a response, or trackback from your own site.